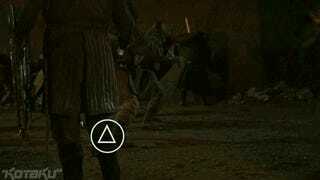 A couple of weeks ago, Chris made some gifs of the best ultraviolence from Game of Thrones' "Blackwater" episode. Yesterday, he put together these fantastic gifs of Mad Men reimagined as a video game. On something of a dare from one of our lovely Kotaku commenters, Chris has now combined the two ideas, rendering Tyrion Lannister's greatest moment from Blackwater into a Heavy Rain-style video game.